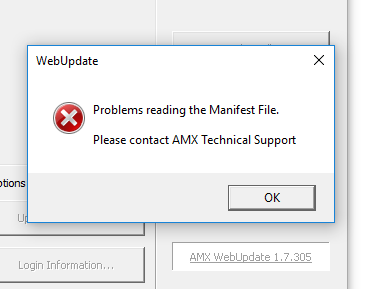 I recently had to replace a hard drive and installed webupdate to get my amx tools installed. Is the web service which delivers the applications manifest XML file down? yep, getting the same on all PC's. I am also receiving this error and have reported it internally. Talked to Pete about it on Monday. They are aware. Then again with the "Downsizing" yesterday, who knows? The issue comes from an upgrade of IIS. Progress was made yesterday, but there is now an issue in parsing out the URL of the files that are discovered. IT is engaged and working on it. Seems to be working as of 2200Hrs ET 2017-09-13. I too was successful. The g5 support files were not downloading for me, and now they are.